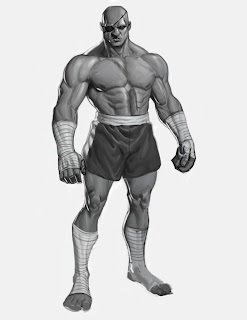 Here's a Sagat I started. Probably finish at work today. Anyway, have a great Thanksgiving guys!! steroid'ed out and everything! great! Adam Brown must not know you, it's like bringing sand to the beach.... doesn't he know you are very fit and run marathons?? Hey Brian Post some more stuff!! Our Game has been anounced! YAY!!! STREET FIGHTER 4 IS BEING MADE!!!!! !